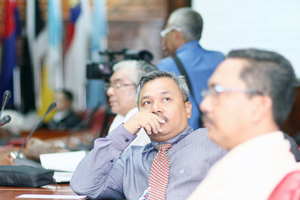 BANGI, 27 March 2013 – Malaysia is historically very well placed to engage in intercivilisational dialogue despite experiencing racial and religious friction in recent times. 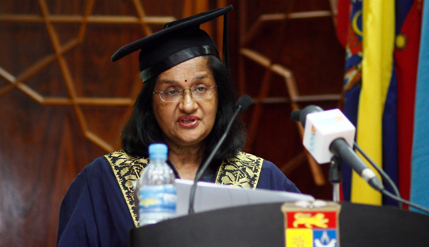 The Institute of Occidental Studies (IKON) of The National University of Malaysia (UKM) Principal Fellow, Professor Dr Shanta Nair-Venugopal said Malaysia’s capacity for cultural dialogue is the outcome of the Malay Peninsula being historically a meeting point for Islamic, Hindu, Buddhist and Christian influences. Delivering her inaugural public lecture on The Discourse of Occidental Studies: A Perspective from Malaysia, here today, she said Malaysian scholars are well versed in such cultural interactions, having studied the relations between the East and West closely for many years. Prof Shanta said Malaysia in particular and Asia in general is resurfacing prominently in the role of a bridge between cultures, partly because Occidentalists are predicting that the East will be better off than the West in the near future. The peninsula, like many lands in the Orient had been colonised and de-colonised by Western powers, giving the possibility that Asians can be cosmopolitan or savvy about western affairs. She said despite western interest in the cultures of the East, we have the potential to know better about them because of the political, trade and cultural interactions over hundreds of years. Globalisation has made western norms and cultures more accessible. Studying about western ways and thinking will give Malaysia an advantage over other neighbouring countries which may have a narrower view of the Occident. Studying western behaviour and trying to anticipate how westerners react to cultures other than their own is nothing new in this part of the world. There were those in the Malay Peninsula who took a negative view of the western world, while others might have mixed representations of the Occident i.e. both good and bad to emerge from the west. Among the Malays of the early modern era, it has been suggested that Abdullah Munshi, the scribe and author who worked for Sir Stamford Raffles, was an Occidentalist. Those familiar with his autobiography Hikayat Abdullah would notice that he almost always praised the Europeans he writes for. Abdullah’s critics call him a Western apologist because of this. In more contemporary times, Prof Syed Hussein Alatas wrote about the absurdity of the British i.e. Westerners who looked down on the “natives” or Malays for supposedly being backward. In his highly acclaimed work The Myth of the Lazy Native, he demolished the assertion by pointing out that perceived lack of Malay interest in working for the British was actually a form of passive resistance to British rule. Another form of Malaysian Occidentalism emerged with a suggestion by former Prime Minister, Tun Dr Mahathir Mohamad that Malaysians “investigate” the West instead of being the subject of research by Westerners. Prof Shanta said Tun Dr Mahathir’s own “Look East” policy is interpreted as a form of Occidentalism in which the Western model is renounced in favour of Japan. His “Look East” policy complemented the other form of Occidentalism: the “Buy British Last” policy in the 1980s and early 1990 – sparked off by the London Stock Exchange amending its trading rules in the wake of the “dawn raid” takeover by Malaysia of the British-owned Malaysian plantation group Guthrie. The policy was largely prompted by the British media’s and the LSE’s hostile reaction to the takeover. Later in the 1990s the British media urged Whitehall to investigate allegations of corruption in the sale of arms to Malaysia. Prof Shanta was previously professor in language studies (sociolinguistics and intercultural communication) in the School of Language Studies and Linguistics (SoLLs), UKM. Currently engaged in interdisciplinary work, she taught, supervised and examined undergraduates and graduates in English language studies for more than thirty years. She graduated from Universiti Malaya in 1972 with an honours degree in English and was awarded a Master degree in 1984. In 1997 she completed her PhD in sociolinguistics at the University of Wales, Cardiff. She specialises in Sociolinguistics, Language and intercultural communication, Business discourse and English in the local and global context.